Music- the capacity for it to move your soul, to uplift your spirit, to speak to you when you most need it is an amazing gift from the universe. Music is something that has been a part of me since i was a child - whether it be singing at a really young age at our place of worship, to dancing to the bollywood tunes that I grew up with, to creating mixes or compilations of various artists/themes to using music to inspire me to write. If you don't have music as part of your life, you are missing out on something. Whatever it be I am always in awe at the way it has the capacity to move me. I see it in my son - at a very tender age he has been exposed to music - and he uses it in many ways - he uses it to soothe himself when he is upset - he will use it to make him happy -it is a wonderful delight to see how he can use that as a tool for himself. I write today about music because just like how it has the amazing effect to open up channels in us that we sometimes are not aware of - the same thing exists with journaling. It takes us to another level in us that we are not aware of and allows us to open ourselves to new experiences and be open to everyday experiences that occur. I usually like to write in silence - where there is no disturbance and no interruptions. However that may not work for everyone. Sometimes the silence is too much and often for those that have a difficult time with silence using a music prompt can help with journaling. 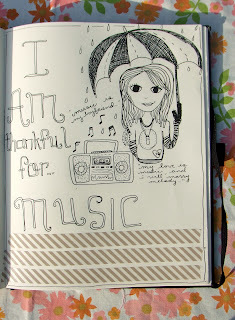 Journaling to the right music can help evoke the emotions in what is trying to come out - whatever that may be. I will say that the research shows that journaling to instrumental/classical pieces have a more profound impact then lets say pop/top forty type music - however you have to find out what works for you and what the purpose of the journal entry is. One of the workshops that I conducted a couple of years ago, I played an instrumental piece for the participants and asked them to write for five minutes. I wanted them to see if there was a difference in their writing with music playing in their background. I also wanted to give those who don't want to write in silence other modalities to let the creative fire come out. I know for a fact that I find my writing style very different when I write with music and when I don't. I think it depends on your style - and it also depends on what you are trying to do. Music can also help with getting unstuck. So often we wake up and can't pinpoint what it is we are feeling - how we are feeling - we just know we are feeling a certain way....or Let's say that you are feeling stuck, or feeling blue, or feeling overwhelmed - but not know exactly how to put that in words - sometimes choosing that certain kind of music that help bring out the emotion and can help you write it out better. How do you choose the right music - are you one to focus more on the lyrics - is it the beat, the rhythm? what is it that strucks a chord in you? pick that out - put on them music, pick up the pen and let your hand move. Music can also have a calming effect. For those of us that can get anxious often or for those of us who tend to worry - putting on something instrumental can be soothing and take us into a relaxed mode. Write while that music is playing to see if it has an effect on your mood. Music can also be a huge inspiration to create writing prompts especially if you are looking for writing ideas and sometimes just listening to something you like can give you something to work with. You can take a line from a song and maybe write a poem from it. Or you can take the rhythm and begin to use the emotion it invokes to create something fictional. Or it can take you back to a particular memory and have you write about something that u haven't thought about in a long time. We often take for granted the impact music has on us in our everyday life. In the last two weeks, i have been working on an exercsie for myself - i began to be more mindful of the music i chose to listen to - i noticed if there was an improvement in my mood, in the way i spoke, in my energy, and in my writing - i also noticed if began to be more creatively inspired with that - and i experimented with various styles - from what is playing on the radio to what I am normally drawn to - I found that my lensview was different and more positive- i also found myself writing more. It was an interesting experiment for me and i want to share that with you. What does music mean to you? Use one prompt and see if helps....Be more mindful of music in your everyday life.